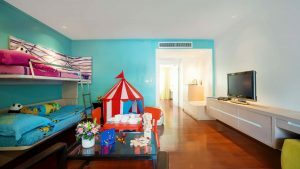 The One Bedroom Family Fun Suite is the perfect place for smaller families. This Phuket Family Resort offers a perfect family set up in 43 sqm suite. This room comprises of a bedroom with a king bed and a bathroom with shower. Bunk beds for 2 children with gorgeous kids set up with colourful tents, plush toys, and bean bags, plus kids bathroom amenities. Moreover, your kids can also enjoy playing their favourite games on the PlayStation 4 (On request and subject to availability). The suite also comes with coffee and tea making facilities. A spacious private balcony with pool view. Each of the suites features an LCD TV, personal safe and an iron with ironing board, a large writing desk. Stay connected with complimentary WiFi internet. All-inclusive meals and drinks are also available for kids, every day from 11 am to 10 pm.